French aeronaut who was the first person to perfect the parachute, and made a number of successful jumps from greater altitudes than had been attempted before. [p.102] During the first French Revolution, ascents were frequently made to celebrate great national events. Indeed, the new Constitution of the French Republic was magniloquently proclaimed to the sun and the clouds from a balloon at the height of 12,000 feet. André Jacques Garnerin (born 1769), the most celebrated of the aeronauts of this period, was a pupil of the physical class of M. Charles. He was only about nineteen years old when he first tried his fortune in the air. His first experiment was made at Metz in 1787. He made a fortunate ascent with a lady of Turmerman, and descended at a distance of nine miles. In 1790 he set out with a simple montgolfiere from the gardens of Ruggieri. It appears that he had attempted captive ascents at the Luxembourg with an air balloon, and that it was partly the success of his experiments which led to the organisation of the corps of military balloonists, of whose fortunes we have given some account. But the accomplished aeronaut was sent on a political mission which prevented him from having any share in the work of that corps. Garnerin's elder brother had rendered Government [p.103] some service, and was rewarded by receiving the appointment of Commissary to the French Armies. Young Garnerin was soon sent on a similar mission. The division of the army that young Garnerin had been sent to inspect was in a most precarious position, and shortly after his arrival was defeated (1793), and Garnerin fell into the power of the English. The latter handed him over to the Austrians, by whom he was imprisoned in the fortress of Buda, in Hungary, where he was kept for about two years. On his return to France he betook himself again to aeronautics, and associated his brother with himself in making great public experiments. In order to secure public interest, he made night ascents in which he carried a lamp to light up his balloon. Garnerin states in his memoirs that while in prison he thought of making use of the parachute for the purpose of escaping. Garnerin and his elder brother subsequently disputed bitterly the honour of inventing this apparatus, which, as we have seen, was years before made use of by Blanchard. Garnerin, however, was the first human being, so far as authentic accounts go, who made the first descent in a parachute. The first public experiment was to have been made on June 15th, 1797, in the garden of the Byron Hotel, now the Convent of the Sacred Heart. The balloon in which Garnerin was to ascend was ready, and he was about to step into the car, when a squall of wind tore the balloon into shreds. The spectators were indignant, and the balloonists had to take to flight to escape the public [p.104] fury. One of the spectators accused the two brothers of swindling, and of extorting his money from him under false pretences, and it was with some difficulty they obtained their liberty on bail. Three days later young Garnerin did make a descent in his parachute in the Gardens of Tivoli. Garnerin made his experiment in the parachute in a most theatrical manner, and under conditions well calculated to produce a profound sensation. He had devised a mechanism by which the balloon was torn open while the rope was cut. Supported by his parachute, which seems to have been attached to the balloon in place of the car, the daring aeronaut reached the ground in safety after the remains of the balloon had fallen. [p.105] In the first experiment the parachute oscillated in a most violent manner, and to prevent himself from being pitched out of the car he had to hold on with all his strength. 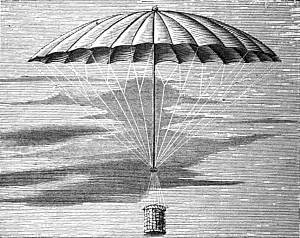 Jérôme de Lalande, the famous astronomer, and who at first was violently opposed to ballooning as a theoretical impossibility, perceived that the cause of these oscillations was that the air compressed by the descent of the parachute could not escape in a regular manner. He advised, therefore, that a hole should be made in the centre of the parachute, in order that the air might thus run out of it with regularity. This was afterwards done, and hence the apparatus, notwithstanding its immense size, resembling a gigantic umbrella, became perfectly manageable. After these preliminary experiments with the parachute, Garnerin wished to make balloon ascents in company with a lady, Mademoiselle Célestine [p.106] Henry, but in this he met with unexpected opposition from the police. The latter were supported by some of the medical faculty, who maintained that the effect of an ascent would be disastrous to the delicate constitution of a young lady. It took two months' incessant application and explanation ere Mademoiselle Henry received permission to accompany Garnerin, and then only after she had been minutely questioned and given a solemn assurance that no secret influence had been used, but that she desired to ascend of her own free will. In this difficulty, Garnerin received unexpected and generous support from Lalande, who, when at last the young lady was permitted to make the ascent, gallantly led her to the car on his arm. Garnerin made two ascents with his brave companion. The first ended near a village named Dugny, where Garnerin met with quite an unforeseen difficulty. A municipal official demanded a passport from the travellers, and as they could not comply with the demand they were arrested. It required the indignation and threats of the people who had been attracted by the descent of the balloon to compel this too zealous official to release his two captives. The journals of the time could not fail to comment on this ludicrous incident. The official, whose name was Hennequin, was mercilessly chaffed. He wrote a letter in justification of his conduct, in which he tried to pass the affair off jocularly. “You forget, Mr. Editor,” he said in effect, “that the duties of my position require me to arrest vagabonds, and that nothing more resembles a vagabond than a person falling [p.107] from the clouds.” From that time Garnerin took the precaution of carrying a passport; but in his second descent he fell into the hands of a person who could not read, and consequently his passport was a dead-letter. In the course of 1798 Garnerin made many ascents of long duration, sometimes alone, sometimes with a companion. On each occasion he was careful to note the speed of his balloon and the direction which it followed, for the purpose of proving that he could carry instructions to armies much more rapidly than any system of telegraphing then in use. These aerial journeys of Garnerin were not without value from a scientific point of view, for he carried vessels filled with water, which he emptied and then shut up at a very great height for the purpose of taking down with him samples of air of the higher regions. The first analyses were made by Humboldt, who found that the proportion of oxygen had diminished by two per cent. During this time Blanchard, who had returned from America, endeavoured to draw attention to himself. He announced his intention of crossing the Atlantic by means of one of his famous aerial flotillas. He had constructed for this purpose a car which he maintained would not sink, and which he got tremendously advertised and puffed. We need scarcely say that this vast chimerical project was never executed. 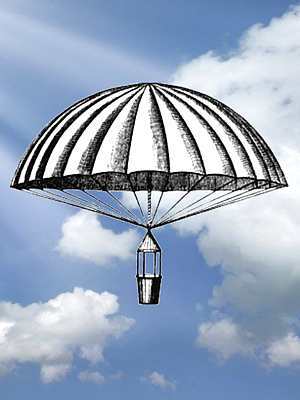 At the same time the old aeronaut claimed the invention of the parachute. Garnerin sharply defended his right to the invention. Blanchard at last resolved to gain the laughers to [p.108] his side by imitating his rival, and showing that his parachute was as serviceable as that of Garnerin's for descending from the clouds; for Garnerin maintained that his parachute was really a new invention, Blanchard's being only of use in the case of cats and dogs. It was in July 1799 that this experiment was made from the Gardens of Tivoli, on the ground now covered by the Western Railway Station. There were light and not very steady winds. Blanchard took advantage of them to cross the Seine twice and perform numerous circuits in sight of the public, who from all parts of Paris kept their eyes fixed on the balloon. When he found himself above the Bois de Boulogne he cut the cord by which his parachute was held, and came down gently, without accident, in one of the splendid gardens which then adorned that part of the environs of Paris. This success, of course, could not prove the validity of his claims, but it brought him an honour which he little expected. Lalande, the astronomer, at last accepted the proposal made twelve years previously, and consented to accompany Blanchard in a balloon. Blanchard, having given up all idea of mechanical direction, discovered a much more simple process for guiding his aerial flotilla. It was sufficient to lower a sort of sail acting somewhat like a movable anchor for fixing to some extent the route of the aerial navigator, and prevent him quitting a favourable current when once he found it. Nothing could be more artless than the reasoning employed by the Director of the Paris Observatory, for such was [p.109] Lalande at this time, to prove that he could find a wind that would guide him in any direction he chose. “It is very probable,” he wrote in an official article published in the Moniteur, “that the upper atmosphere is occupied by a current from the west; consequently we may presume that before reaching this height Blanchard will reach an oblique wind coming from about W.S.W.” This was the wind which the Director of the Paris Observatory wished to follow, for he intended to pay a visit to his colleague at Gotha. What was not less strange than the confidence of the French astronomer, was the extraordinary sensation which the announcement of the experiment produced in Germany. As little able as their French colleagues to perceive the absurdity of a most grotesque proposal, the German savants came from all parts to the Observatory at which the adventurous Lalande was to arrive. The police officials of the German principality bestirred themselves. They felt uneasy at the revolutionary propaganda which the astronomer of the French Republic, descending from heaven like a new prophet, would be sure to make. But all their preparations were found useless, for this ascent, so pompously announced, did not last many minutes. The balloon on which all the savants of Germany were ready to fix their telescopes, rose at Tivoli and came down at the Bois de Boulogne. Immediately the rumour spread that Blanchard had been corrupted by the foreigner. Had it occurred in the time of Robespierre, who held aeronauts in horror [p.110] like every good terrorist, Blanchard would have had a fine chance of being guillotined. It was on October 21st, 1798, at this epoch of aeronautical revival, that Testu Brissy made his first equestrian ascent at Bellevue. He had not succeeded in his first attempt on January 7th preceding. The experiment was not made in the same manner as in our own time, when horses have been unceremoniously attached underneath the car by means of girths. Testu Brissy took the trouble of placing his horse on a platform of wood, and mounted on his back armed cap-a-pie like a chevalier of the middle ages. The ascent was rather unpleasant, as the horse became a somewhat embarrassing object to pull down, but the aeronaut did not experience any accident. Testu Brissy, in his first ascent, established a very interesting physiological fact. The blood of the horse begins to flow from the nostrils and ears at a height at which man suffers no inconvenience. This circumstance gave rise to a singular incident, when, half a century later, it was attempted to introduce into England equestrian ascents, revived and modified in France by M. and Mme. Poitévin. Green, of whom we shall hear much further on, wishing to sustain his old reputation for novelty, announced that he would make an equestrian ascent from Cremorne Gardens. But the Society for the Prevention of Cruelty to Animals interfered, on the ground that horses could not, like men, sustain the depression, and that it would be cruelty to subject them to an exercise which is an invariable cause of bleeding. [p.111] Not wishing to contest the matter, Green sought for a horse that would not bleed; he made his ascent on a wooden horse. The representation, thus somewhat burlesqued, was an immense success. But we need not say that Green did not repeat it. As soon as the Peace of Amiens was concluded (March 1802), Garnerin received pressing invitations from the French ambassadors at various foreign courts, where he was enthusiastically received. His welcome was sometimes so cordial as to give rise to a rumour that he was entrusted with a secret mission by the First Consul, Napoleon Bonaparte. It was in England that Garnerin made his first ascent abroad, and the parachute became quite the rage. It was even more successful than Blanchard's famous flying ship. The London public so lionised Garnerin that the only obstacles he met with were those presented by nature and the ignorance of the country people. Sometimes, in a remote part of the country, he could find no one to help him in his descent; instead of holding the ropes, the peasants thought it advisable to save themselves by taking flight. The partisans of France made it their duty to render Garnerin all possible assistance. Thus, at a grand ascent made from North Audley Street, London, it is stated that the great Sheridan himself cut the cord of silk that held one of Garnerin's experimental balloons. Garnerin, after leaving England, went to Berlin, where he met with a curious series of adventures. A certain Hermbstädt, Professor of Chemistry in the [p.112]University of Halle, and a Councillor of State, jealous, it is said, of the glory of Lalande, offered 200 fredericks d'or to the French aeronaut to purchase a place in his car. Garnerin accepted the offer; but like a man who had a good eye to business resolved to take his passenger with him during a public ascent; otherwise the Professor's money would all have been absorbed in the expense of inflation. Lalande did not deem it derogatory to his dignity to ascend from the midst of a crowd, and why should the German Professor go about the matter secretly, as if he were doing an evil deed? The car was large enough to hold three persons—Garnerin, his wife, and the Professor. 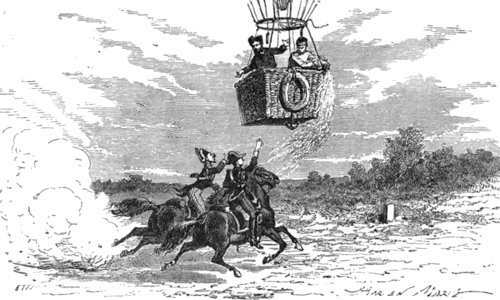 Garnerin, however, told the Professor that some unforeseen circumstances might occur to prevent all three ascending at one time, but that he himself and his wife would ascend first, and the Professor could follow the direction of the balloon on horseback, and would be taken in after a short distance was run. After having satisfied the assembled public, Garnerin would descend in the neighbourhood of Berlin, and depositing his wife, would take the Professor on board the car, and carry him up to or beyond the clouds with all his scientific instruments. But none of these brilliant promises could seduce the brave Prussian Professor, who persisted in his demands. Garnerin then announced that he would make the ascent, and that the place in the car would be at the disposal of the Professor; but that, if the latter was not present at the time of departure, he would take with him gratis an inhabitant of Berlin. So said, so done. Garnerin set out in presence of the King and Queen of Prussia, having with him his wife and a well-known Berlin merchant. The ascent was successful. Garnerin, his wife, and their companion remained several hours in the air. On his return to Berlin, Garnerin declared that according to his barometer he had reached a height of 6300 feet. The height was nothing extraordinary, but it seems to have been too great for the friends of Professor Hermbstädt. Dr. Gilbert, editor of the ‘Annalen der Physik’ wrote to prove that Garnerin could not have exceeded 4200 feet: a height too inconsiderable to satisfy so eminent a savant as Dr. Hermbstädt. He did not require to mount in a balloon to reach a height even greater than that. Was he not in the habit of watching the famous Spectre of the Brocken on the top of the Harz Mountains? Hermbstädt had indeed rendered great service to science by refusing to risk his valuable life. Thus wrote Dr. Gilbert, who however, it should be [p.114] remembered, was a really able and eminent scientific man. In spite of Gilbert's objections, the Court of Prussia loaded Garnerin with honours and presents. From Berlin Garnerin proceeded to Russia, where he was received by the Emperor with as much distinction as if he had been the most popular opera singer of the day. He made many ascents with his wife, which were at least great financial successes. Before returning to France, Garnerin of course took all possible advantage of so rich a field; but his later ascents in Moscow were not without danger. He returned to France with great store of roubles and with the self-imposed title of the Great Aeronaut of the North. 31 Jan - short biography, births, deaths and events on date of Garnerin's birth.